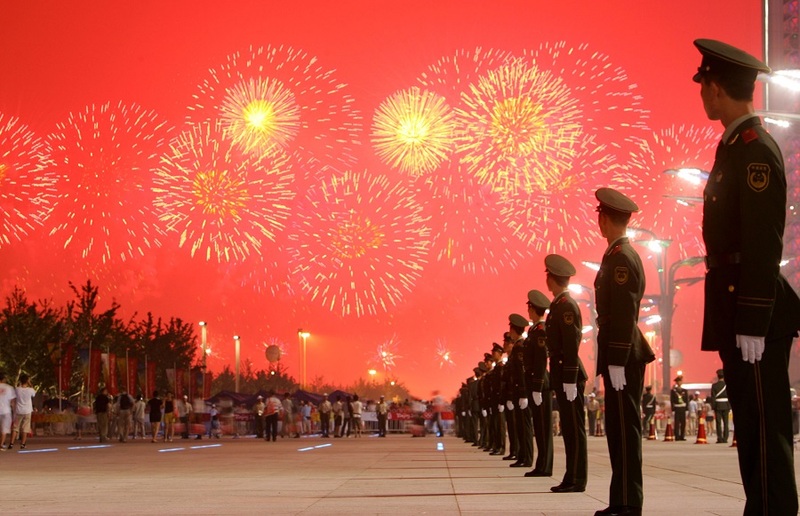 Fireworks light up the sky as paramilitary policemen stand guard during the Opening Ceremony for the Beijing 2008 Olympic Games in Beijing, August 8, 2008. Special thanks to Maura Cunningham for organizing and curating this Conversation. Looking back to 2008, I am struck by the way that the Olympic Games debuted a 21st-century Han ethnocentric vision of China for an international audience. At the time, China scholars noted that Mao Zedong was absent from the festivities, while Confucius got plenty of air time. There was no celebration in the opening ceremony, for instance, of the socialist state, nor the Chinese Communist Party (C.C.P.) at its helm. Instead, Confucian disciples paraded onto the field to represent China’s “Brilliant Civilization” (the theme for part of the opening ceremony). The historical pastiche that followed skipped the still sensitive 20th century. With a burgeoning cult of personality for Xi Jinping and an increasingly heavy presence of the Party in daily life, the C.C.P. is certainly not in the background now (not that it really ever was). Yet given Xi’s consolidation of power and revelations about the detention of hundreds of thousands of Uighur people in internment camps—with these and other abuses justified by national strengthening and consolidation—this early vision of the “Chinese Dream” seems ominous rather than celebratory. The Olympic year was an eventful one. In 2008, we saw, among other things: the Tibetan uprisings, the Wenchuan earthquake and widespread death of children in shoddily built schools, the protests along the Olympic torch relay route, a scandal over melamine-tainted milk powder, and a rising number of protests (online and physical) around local political and social issues, including the end-of-the-year manifesto, Charter 08, for which Liu Xiaobo was awarded the Nobel Peace Prize while in prison. There were two general ways that China scholars read these events. Some (including myself) were optimistic about the responses of civil society and hopeful it would lead to continued opening up. Others were concerned about the often violent response of the Party-state as it silenced its critics. These were not mutually exclusive viewpoints, but many who were optimistic felt that momentum was towards greater freedom and rule of law in China. Nevertheless, the shallowness of the state’s commitment to a truly multiethnic state, women’s equality, religious tolerance, and a more even distribution of wealth—all issues that have come to the fore over the past decade—were apparent in 2008. The manner of Xi’s rule was not clear then, but the possibility for inequality, corruption, and abuse of power was. These elements of 2008 feel critically relevant today. Even so, historians are cautious about interpreting the past through the lens of the present. Historical narratives that seem perfectly logical today (the nascent civil society of a decade ago has been extinguished by an increasingly totalitarian state) can seem short-sighted in another decade or two (when, say, the roots of a robust 2030s civil society will be traced to the aughts or a revolution in 2048 is seen as the result of 30 years of heavy-handed oppression). For that reason, I remain hopeful that the future histories of the present will tell a different story about 2008. In the months leading up to the 2008 Beijing Summer Olympics, two narrative threads dominated discussions about the upcoming games. The first storyline was about all the ways the Olympics could go wrong: the air might be too polluted for athletes. Contaminated food could cause false-positive drug tests. The new subway lines constructed to shuttle a massive influx of visitors might not be ready on time. The second storyline focused on all the ominous steps the Chinese Communist Party (C.C.P.) leadership had taken to ensure the Olympics went right: evicting residents whose homes stood in the way of venue construction. Placing activists and their families under house arrest to prevent protests during the games. Attempting to control the weather. The C.C.P. left nothing to chance: This was the country’s opportunity to impress the world with its advanced infrastructure and well-prepared citizenry. Foreign expectations of “China’s coming-out party” were simultaneously low (how could a still-developing country ever pull this off?) and high (an authoritarian one-party state should be able to pull off the best Olympics the world has ever seen). In the end, the 2008 games proceeded more or less without a hitch, an almost anti-climactic end to the years of speculation and anticipated schadenfreude of those who didn’t think the C.C.P. could carry out a global mega-event. Now, the success of the Beijing Olympics a decade in the past, 2008 seems the moment when the People’s Republic of China proved, once and for all, that “the end of history” wasn’t on the horizon. Proponents of liberal democracy who hoped that the games might foster regime change in Beijing (as had happened in South Korea prior to the 1988 Seoul Olympics) were disappointed. Yes, the International Olympic Committee forced the C.C.P. to comply with some of its demands (such as reducing, though not eliminating, Internet censorship at the 11th hour). But by and large, China’s leadership carried out the Olympics on its own terms, and attracted relatively little pushback for doing so. It wasn’t only the symbolic victory of the Olympics that created the more confident and assertive Chinese leadership we’ve seen on the international stage over the past 10 years, but those two weeks in August almost certainly confirmed to the C.C.P. that the time had come for China to step up. In the face of all that could have gone wrong, the country’s leaders had ensured that everything went right. China was ready to play a bigger role in the world. On Aug 6, 2008, when several American Olympic cyclists arrived in Beijing wearing face masks, they were greeted with harsh criticism for “insulting” their host. They later apologized to “the Chinese people.” The episode captured the zeitgeist of the time: China was on the eve of holding its “coming-out party” as a world power. No one was to derail it, even for legitimate environmental and health concerns. On the other hand, as the cyclist episode has shown, the Olympics also introduced a strong nationalistic element into China’s environmental discourse, complicating the country’s progress toward sustainability. In 2012, Senior Chinese officials famously accused the United States of meddling with Chinese domestic affairs by releasing air quality monitoring data from the roof of its Beijing Embassy. In 2015, journalist Chai Jing’s groundbreaking independent documentary on air pollution met with conspiracy theories stating that she was part of a Western plot to thwart China’s industrial development. But if Chinese society was in denial about the environmental crisis when it criticized the American athletes, the 10 years since show a country overcoming the nationalist distraction and owning up to the environmental challenge. A convergence of new developments including the advance of Chinese social media, higher affluence levels, and the arrival of a new leadership contributed to the post-Olympic environmental awakening, when a string of “airpocalypse” events shook the consciousness of much of urban China. As Hu Yong, a Peking University researcher of the Chinese Internet, put it in a 2011 article, those post-Olympics years witnessed how the nationalist narrative struggled to hold on as more pressing domestic issues emerged. “When you realize the milk your children drink and the air you breathe aren’t safe, nationalism can’t keep dominating the agenda,” he wrote. Therefore, neither the confrontation with the U.S. Embassy nor the attack on Chai Jing managed to change the course of China’s ecological reckoning. The country is now largely on-track to clean up its polluted air and water, and has embraced its role in global environmental governance. At least in the environmental area, the China of 2018 is different from that of 2008 in a positive way. Ten years ago, I was living in a residential courtyard in the center of Beijing. On the state television broadcast of the Opening Ceremonies of the 2008 Olympics, I watched as an impressive array of synchronized firework footprints illuminated the night sky at regular intervals along the 9 mile central axis of the capital. I rushed outside to see if I could catch a glimpse as the fireworks continued overhead in their northward path towards the Bird’s Nest stadium. My neighbors regarded me in their typically bemused way. The silly foreigner did not realize what everybody else knew: The firework display through the city had been simulated using computers. Like CGI fireworks, much of the hope and optimism of the 2008 Olympic era has unfortunately proven illusory. That the games were a success was an enormous boost to the Party’s confidence and a source of great pride for many—if not most—of the people living in China. The venues were ready on time, and no significant demonstrations or political statements disrupted the games. The skies were made a uniform blue. The migrant workers who worked around the clock to make the city ready for its close-up were banished to their home villages. Dissidents were told to take a vacation. Streets were cleaned. Loos scrubbed. The angelic voices of children sang to welcome the world to the opening ceremonies, while prettier children lip-synced on camera to be sure the world did not get the wrong impression about China. Nothing was left to chance. China’s impressive medal tally only added to that enthusiasm. One of the hopes of many international observers was that the Olympics would be the beginning of a new era of internationalization in China, and Beijing would take its place as a truly global city. There was little optimism, at least here in Beijing, of significant political changes, but there seemed to be a trend—in fits and starts to be sure—of greater openness. There was perhaps an excessive hope that the experience of welcoming the world in 2008, along with a new sense of national confidence, could be the start of growing engagement with global culture. Since then, the trend has been retrogression. Rather than becoming a genuinely global and cosmopolitan world capital, Beijing is instead being transformed into a showpiece of state power. Small shops, galleries, and businesses opened by entrepreneurs from across China and around the world shuttered. NGOs and community organizations threatened and disrupted. What many consider cosmopolitanism, the Party sees as decadence and disloyalty. The Winter Games will come to Beijing and nearby Zhangjiakou in 2022, but there is noticeably less Olympic fever this time. Maybe the Winter games are less exciting to Chinese sports fans. Perhaps the Olympic ideals of global community are impossibly quaint in today’s age of tribalism. Maybe opening to the world is no longer a priority—or even desirable—to the men who rule China. What is clear, however, is that we are a long way from 2008. Ahead of the 2008 Beijing Olympics, then President of the International Olympic Committee (IOC) Jacques Rogge argued, “We believe the Games are . . . going to be a force for good.” But despite all the evidence of human rights abuses committed by the Chinese government in pursuit of producing the perfect Games—restrictions on press and Internet freedom, labor rights violations, the use of gender discriminatory job ads, forced evictions—the IOC never changed its sunny rhetoric. Ten years later, as the IOC prepares for the 2022 Winter Games, it will find a Chinese government that’s gone higher, faster, and stronger on human rights violations than might have been conceivable in 2008. Today, Chinese authorities’ hostility towards ethnic minorities has mutated to the point of arbitrarily detaining hundreds of thousands of ethnically Turkic Muslim minorities indefinitely in “political education” camps. A high-tech mass surveillance state is designed to engineer a unique dissent-free society. And China, as a global power, is assiduously undermining human rights protections in institutions ranging from the United Nations Human Rights Council to Interpol to the One Belt, One Road development initiative. The IOC and other governments that claim to care about human rights in China aren’t to blame for the crackdown on civil society or Beijing’s significant expansion of the security apparatus for the 2008 Games—which directly contributed to impunity for abuses since that time. But they do share blame for failing to vigorously push back against human rights violations. As was the case when the Chinese government began its reform era in 1979, or when it joined the World Trade Organization in 2001, politicians expressed a child-like faith that a successful Olympics would help lead to political liberalization and a more cooperative China on the world stage. Beijing, of course, had a rather different premise: that if the world went along with its Games, abuses and all, it would be another sign that China could reasonably expect the world would overlook its torture, arbitrary detention, or horrific abuses of peaceful activists beyond the Olympic period. And that is what has happened. The Chinese leadership treated the 2008 Games as a coming-out party to showcase its new strengths. A decade later, it is now considerably more aggressive in a way that should alarm leaders and people around the world. The IOC claims it has built respect for human rights into its expectations for hosts, but this will absolutely be tested during the preparation period between now and the 2022 Games. For whom, then, should the world cheer? Indisputably for the courageous human rights defenders Xi Jinping has sought to silence. For the release of all those wrongfully detained across the country. For a defense of institutions and occasions—including Olympics—that are meant to uphold human rights. But not for China’s downward human rights spiral. The summer Olympics of 2008, viewed with the hindsight of a decade, are a useful prism through which to observe the changes that have occurred in China since. Two narrative shifts are noticeable in the refracted light of these last 10 years: the way the world views China, and the way China views itself. I first moved to Beijing during the Olympics, three days before the closing ceremony, for which I bought a ticket off a scalper. At the time, the drum-beat was one of rising Chinese importance in the world, which drew my generation, fresh out of college, to live here and study Mandarin. For observers like me, the hope was that as China became a responsible global stakeholder—the “coming-out party” metaphor was as ubiquitous then as it is on this thread—it would open up and become more liberal, early signs of which at the time included a blooming of public debate on blogs and BBS forums, and a blind-eye turned to civil society forming around such issues as AIDS and environmentalism, previously no-go zones. As others have noted, that progress was illusory. The Olympics instead marked the end of that relative period of openness, as China’s government became confident enough in its continued growth, and in foreign acceptance of its political model, to become more brazenly what it was all along. Within a year, Twitter, Facebook, and YouTube were blocked; Tibet and Xinjiang became police states in the wake of riots in 2008 and 2009 respectively; and under the aegis of Xi Jinping, human rights and civil society have both been further dissolved. 10 years on, the goodwill generated by the Olympics has faded into a disappointment, and suspicion of China’s intentions abroad, that I would trust is widely reflected in the rest of the world’s attitudes. The second perspective shift is in how China views itself. In 2008, there was still a high degree of prickly nervousness, both on the part of the government – accusing critics of “hurting the feelings of the Chinese people” – and also from the population. The contrast today is stark. Having hosted a number of international events, and with Xi giving speeches at Davos and being fêted by Donald Trump on Twitter, China is more confident than ever, and its people are patriotically behind the state’s growing wealth and power. By many measures, 2018 is the date of China’s true “arrival” on the world stage, and the consummation of its Olympic desires. That is not a bad thing. China has stepped up to deliver on many global responsibilities, both fiscal and environmental, and its people have every right to be proud of their nation’s strength, in the same way that Americans are. But before we accept China’s ascension to the big dogs’ table, we must not forget the broken promises of a decade ago that have created a nation which is muscled, but further away from the truer Olympian ideals of openness and fellow feeling. By the time the Beijing Olympics opened in August of 2008, journalists in China had worked more than a year under vastly improved reporting rules. In the run-up to the Games, the government agreed to loosen restrictions on foreign correspondents, dropping the onerous requirement that we get permission from local officials before traveling on assignment. Reporting was freer for Chinese journalists, too, as we saw during impressive domestic coverage of the Sichuan earthquake earlier in the year. That’s not to say everything was easy, but it seemed things might go in the right direction. By the time the Games opened, reporters covering human rights were routinely harassed and detained. Those of us working on the board of the Foreign Correspondents’ Club of China documented dozens of cases where journalists were blocked from doing their work. What we had under the Olympic rules was the ability to push back. We could call the Ministry of Foreign Affairs for help, we could show cops a copy of the regulation and they would often back off. So when China decided last minute as the Games ended to make the new rules permanent, we celebrated. After the Games, I tested the power of the reporting rules many times. While reporting on healthcare in rural Guizhou, I showed the police who came to my hotel a printed copy of the regulations and they went away. In Guangdong province, while covering a deadly brawl at a toy factory and the subsequent detention of hundreds of Uighur workers—the spark that led to riots in Xinjiang—I placed multiple calls to the Foreign Ministry for help when the cops chased our reporting team and detained our cab driver. It worked. It seemed things might actually change for the better. A few months after the Olympics, I met Ai Weiwei for the first time, for a long interview about his project documenting the child victims of the Sichuan earthquake and the thousands killed in their schools. Ai, who helped design the Olympics’ centerpiece stadium, spoke at length of the need for free expression, a constitutionally protected right of Chinese people, a critical thing that could improve government. By 2010, it was clear that China was dialing back Olympic promises. While reporting on the border with North Korea, I was detained by soldiers who took my passport and informed me the area was a special zone not bound by the State Council regulations. These carve-outs became countrywide, as government control over foreign correspondents tightened once again. Today’s controls on journalists foreign and domestic covering the world’s second-largest economy are far more sophisticated than the old check-ins with local governments. Threats of visa denials and expulsion loom large for correspondents, and all journalists are routinely impeded from doing their jobs. A few days ago, the Beijing government showed up at Ai Weiwei’s Beijing studio without prior notice and demolished the gorgeous compound where he created some of his most famous works. Perhaps it was a fitting metaphor for the end of that decade-ago promise of free expression.